The Baker Trail UltraChallenge is a 50-mile ultramarathon on the Baker Trail. Unlike the Rachel Carson Trail Challenge, this is a footrace; the "challenge" is for you or your relay team to win, or at least finish within 14 hours! The next UltraChallenge is set for Saturday, August 24, 2019. The race starts at 6:30 AM; the deadline for finishing is 8:30 PM. Individuals as well as relay teams of up to 5 members may register. In 2018 the race traversed the central section of the trail, the second leg in the three-leg series. In 2019 we'll cover the south section. 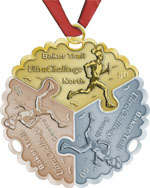 Each year, a piece of a unique three-piece medal will be awarded to all individual finishers. When a participant has completed all three sections, they'll receive a handsome commemorative holder to display all three medals. Registration is open now. See the UltraChallenge 2019 page for details. The Baker Trail is marked as a typical hiking trail. Yellow blazes on trees, telephone poles, fence posts, guard rails, and so on indicate the path. Unlike many hiking trails, the Baker Trail is not always a footpath through the woods. In many areas, it follows dirt or paved country roads, some with narrow shoulders. As with road running everywhere, you must always be alert and cautious. Because of the varying terrain, the UltraChallenge is more mentally demanding than similar ultras. You must always be watching for the blazes in order to stay on the course. In places, the Trail will be following a road only to abruptly turn off the road into the woods. Therefore, if you haven't seen a blaze in a few minutes, you may be off course and should backtrack to the last blaze and determine where you went wrong. Plenty of runners will go off-course at least once during the day. If you expect -- and accept -- that you will, too, it won't be quite as frustrating. The key to a successful race is to realize it quickly. Discuss, comment on, or ask questions about the UltraChallenge on our Facebook page. We need volunteers on UltraChallenge Day! We will need people throughout the day, from morning registration to aid stations along the trail to the finish. People can volunteer for as few as two hours. If you'd like to help out, review and sign up on the Volunteer Roles and Responsibilities page. What's in it for a volunteer? As a thank-you, all volunteers receive a coveted Marshal t-shirt and the gratitude of many strangers! Pittsburgh Tribune-Review: "50-mile race an ultra challenge"
Pittsburgh Post-Gazette: "Ultramarathoner means going farther (inside yourself) than you ever thought possible"